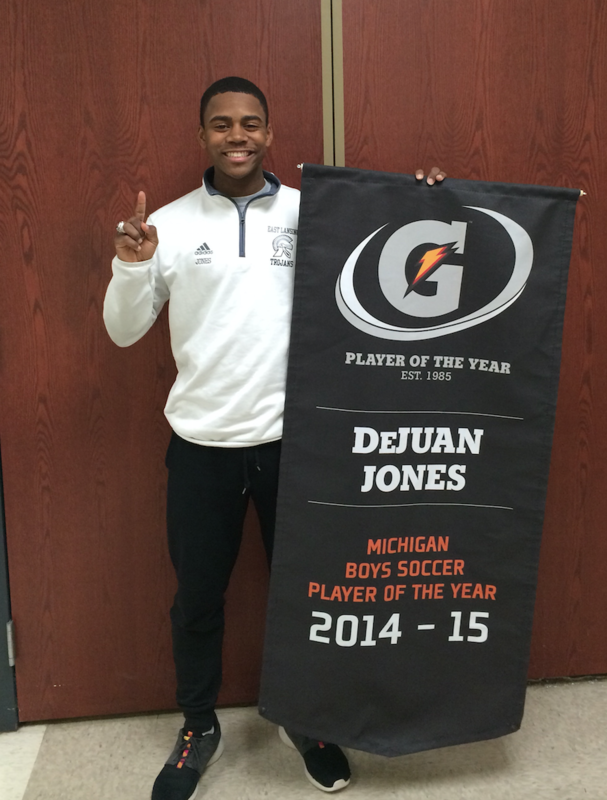 EAST LANSING, Mich. – On Jan. 11, 2019, East Lansing High School alumni, DeJuan Jones, scored the goal he had worked so hard for his entire soccer career. He was chosen as the No. 11 overall pick by the New England Revolution in the 2019 Major League Soccer (MLS) SuperDraft. There have been many players that have gone through the ELHS boys’ soccer program, however, he is the first to be drafted to the MLS. “It’s a special honor because there’s been some great players to come through East Lansing High School, so just to be the first, I can pave the way for others in the future,” he said. Jones, an attacker, was one of 60 college players invited to participate in the pre-draft MLS Player Combine in Orlando from Jan. 3-9. He made a statement by scoring the first goal of the combine, as well as outperforming most others in the assessment tests. He grabbed first place in both the 30-meter dash (3.82) and 5-10-5 shuffle run (3.92), and a third in the vertical jump (35 inches). The legacy that Jones left on ELHS has proven to run deep. He said current high school players have messaged him, telling Jones how inspired they are by him. 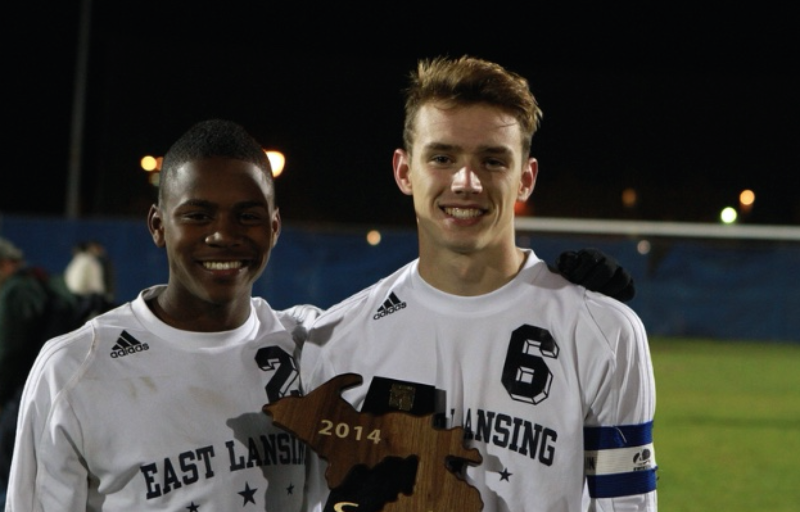 He hopes that other players from East Lansing will make it to the MLS someday too. In his time at East Lansing, Jones had the opportunity to play for longtime head coach, Nick Archer, while on varsity during his sophomore year. With the help of Archer and Coach Jeffrey Lyon, Jones developed into a star player. DeJuan Jones (#2) taking a state championship group picture with teammates at East Lansing High School. Jones continued to progress as an upperclassman. He played for the TNT Dynamite Soccer Club in the off-season with some of his teammates to keep in shape. During his junior season, he was offered a scholarship to continue his career at his dream school, Michigan State. Scholarship in check, Jones led the Trojans to back-to-back Division III State Championships in 2013 and 2014. Archer noted that Jones was a quiet leader, but someone the team always looked toward. His senior season brought many accolades: being named an All-American, Mr. Soccer of Michigan and Michigan Boys Soccer Gatorade Player of the Year. These accomplishments were the end to a great career at East Lansing and laid the beginning foundation for the next at MSU. 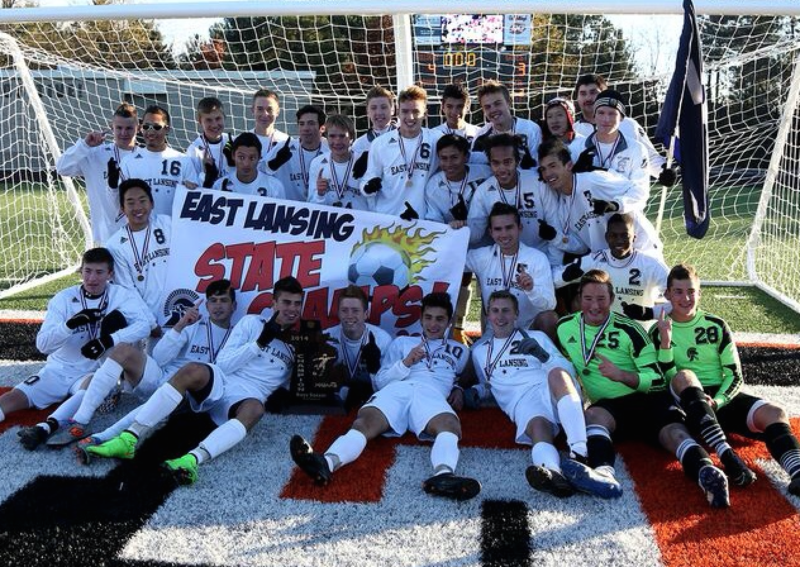 DeJuan Jones (left) celebrating a championship victory while at East Lansing High School. Throughout his career as a Spartan, Jones continued to grow as a leader, versatile player, and key goal scorer. His field vision and passing abilities, developed by Archer, helped him in college too. During the 2018 season, the Jones led the Spartans to the NCAA College Cup national semifinal game, one of the final showcases of his talents before the MLS SuperDraft. Jones has joined the Revolution, heading to Foxborough, Mass. to train for a few short days at Gillette Stadium. The team then flew to Marbella, Spain for two weeks of training and matches. They will play against top players who have competed in the Champions League. “It’s just an amazing opportunity and I’m so blessed,” said Jones.